BELIZE CITY–Since the Immigration scandal broke last year September, there have been calls for Elvin Penner, Cayo Northeast area representative of the ruling United Democratic Party, to resign from Parliament – a move which would be unprecedented in Belize’s parliamentary democracy. Although legally the provisions do exist for such a departure from electoral politics, it has never happened in Belize; that is, until this morning when the National Assembly received a resignation letter – although it was not Penner’s. It was the sudden, bombshell farewell of the PUP’s Cayo North area rep, Joseph Mahmud, who had resigned as the PUP’s standard-bearer for that division last month but who had indicated that he would continue to serve until the general elections, scheduled for 2017. The unexpected resignation of Mahmud in the middle of his first term, and with immediate effect, is unparalleled in Belize’s electoral history. In 1992, Derek Aikman, then Freetown rep for the UDP, was forced to resign due to having been declared bankrupt. In 1975, Vicente Choco crossed the floor from the UDP to the PUP, and in 1989, it was Stanley Usher who did the same, crossing from the UDP over to the PUP. Today, there were also questions raised about whether the ruling United Democratic Party had somehow induced Mahmud to vacate his seat – or whether the internal turmoil which reportedly has been churning in the PUP’s Western Caucus was the trigger for Mahmud’s sudden departure from Parliament. When we contacted Mahmud today, he told us that he was not ready to comment on the reason for his decision. He told us that he had been contemplating resigning “for a few weeks,” but he only today decided not to continue as the PUP area rep for Cayo North. One source told us that Mahmud has had major differences with PUP Deputy Leader Julius Espat and felt that the party has not been able to get a handle on things. When we asked Espat about the allegation that he is a factor in Mahmud’s resignation, he told us that he is not so powerful to have caused the resignation—a resignation which means that a by-election could be forced by year-end. The by-election to fill the Mahmud seat could be the political testing ground for the two dominant parties to gauge the temperature of voter confidence in their parties, leading up to the March 2015 municipal elections, as well as the 2017 general elections. 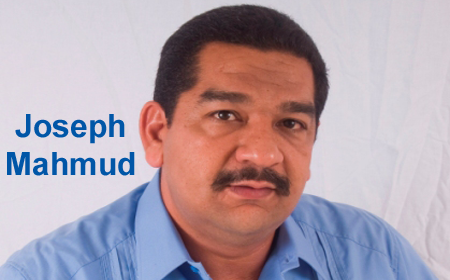 With Joseph Mahmud’s surprise resignation today, Espat said that the Opposition is now in “crisis mode” and they will very shortly decide how they will proceed to fill the political void which Mahmud has left in Cayo. In the 2012 general elections, the PUP garnered two of six Cayo seats in a political face-off which resulted in a slim margin of victory for the ruling party of 17 to 14. With Mahmud’s departure, that seat could fall back into the hands of the UDP, which had won the seat back in 2008, held previously by the PUP’s Ainslie Leslie. In February 2014, former UDP senator, Omar Figueroa, a jaguar researcher, was picked as the ruling party’s standard-bearer in that electoral division. He replaced UDP political veteran Salvador Fernandez, who had been beaten by Mahmud in 2012. Fernandez had won the Cayo North seat in three consecutive general elections – 1984, 1989, and 1993 – and again in 2008. At the height of the immigration scandal surrounding UDP Cayo Northeast area representative Elvin Penner, political pundits did question whether that immigration scandal would have forced a by-election in Penner’s constituency, a by-election possibly causing the UDP to lose a House seat to the Opposition PUP. Many observers say that the ruling party has protected Penner at all costs because it cannot afford to lose a single seat in Parliament. In the 2012 general elections, Mahmud beat UDP Salvador Fernandez by nearly 400 votes to emerge as the PUP’s area rep for Cayo North. He would have contested the 2017 general elections for the PUP, but just over a month ago Mahmud resigned as standard-bearer via a letter to his party. PUP Opposition Leader Francis Fonseca told the media last month that Mahmud had resigned for “personal reasons,” but he did offer to help the party find a replacement. Fonseca was grateful that Mahmud had given the party enough time to allow them to find a replacement, and he had said on record last month that Mahmud intended to continue serving as the PUP’s area rep in Cayo North. Then, Fonseca had said that he was disappointed with Mahmud’s resignation as standard-bearer. We understand Mahmud’s resignation from the National Assembly today has shocked party executives who only received notification of his resignation after it had been submitted to Parliament. An official release from the National Assembly this evening said that Mahmud had resigned at 11:00 this morning when he handed in his letter to Eddie Webster, the Clerk of the National Assembly. The Clerk then contacted the Speaker of the House, Michael Peyrefitte, who is attending ACP meetings in Strasbourg, France, and via e-mail Peyrefitte immediately accepted Mahmud’s resignation. Webster told us that Mahmud gave no reason for his resignation. Even after the National Assembly announced that the Speaker of the House had accepted Mahmud’s resignation, Hon. Julius Espat told us, they (the PUP) had not been informed, but had heard otherwise, of Mahmud’s resignation. This evening, Espat met in Belize City with PUP leader Francis Fonseca. Neither Francis Fonseca, the leader of the PUP, nor Henry Charles Usher, the party chairman, was consulted before Mahmud made his decision to resign from Parliament, Espat told us. After his meeting with Fonseca, Espat told us that they remain optimistic, although they will have to hold emergency meetings of the PUP’s Western Caucus and the national executive in the days ahead to decide the way forward. A late evening press release from the Opposition thanked Mahmud for his service to the PUP and to the people of Cayo North since March 2012, and wished him and his family all the best in their future endeavors. The two reported contenders for the PUP in Cayo North are Michel Chebat, an attorney, and Richard Harrison, a businessman and a longstanding member of the party. “This week, we will be meeting and we will be ready with a candidate as early as possible,” said Espat. He said that the Prime Minister has the right to call the by-election for Cayo North within 90 days, but by law, that by-election can be held in as few as 30 days. Espat conceded that the Opposition will face serious financing issues going into the by-election. “We don’t have PetroCaribe, but in the past, both political parties have gone to elections with major war chests and have lost,” he said, citing the PUP’s defeat in 2008. “The people make the difference,” he said. He said that the upcoming elections will test the mood of the people, and they will know whether the PetroCaribe money has overwhelmed them or whether the people want good governance.